Running Time: 1 hr. 54 min. The post-Iron Man Marvel movies have done a much better job hyping the next film than themselves. Clever cameos and post-credits kickers have gradually paved a path to the inevitable Avengers ensemble, in which Tony Stark, Bruce Banner, and the rest of the marvelous clan will join forces to battle evil and, more significantly, send fanboys into a collective frenzy. In the meantime, Marvel Studios has treated us to a humdrum origin reboot (The Incredible Hulk) and a risible sequel (Iron Man 2). With Captain America opening in July, the summer first kicks off with Thor, a superhero whose (literal) mythology is so abstruse that the film project has languished in Hollywood “development hell” for years. The kindest – and not altogether inconsequential – thing that can be said about director Kenneth Branagh’s adaptation is that it’s probably the best rendering anyone could have made about a Norse god from another dimension who becomes one of Earth’s protectorates. 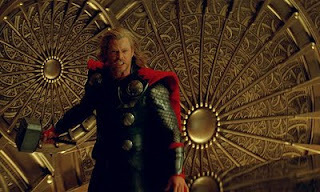 But, for all Thor’s special effects extravaganza and celestial hop scotching, it’s a loud, flashy assembly-line product. On the eve of ascending to king of Asgard, Thor (Chris Hemsworth) has his coronation interrupted by an incursion of marauding Frost Giants, sworn enemies seemingly breaking a longstanding truce. In response, Thor takes his brother Loki (Tom Hiddleston) and four other warrior friends to the frost giants’ home planet intent on wiping them out using his bare hands and his powerful hammer, named Mjolnir. Angered by Thor’s insolence, his father Odin (Anthony Hopkins) banishes both son and mallet down a wormhole to Earth for what amounts to an extended sabbatical to clear the demigod’s head. Thor traipses across the New Mexico desert in search of humility and his precious Mjolnir, accompanied three stargazing scientists – Jane Foster (Natalie Portman), Dr. Erik Selvig (Stellan Skarsgård) and Darcy (Kat Dennings) – and pursued by recurring S.H.I.E.L.D. agent Phil Coulson (Clark Gregg). Meanwhile, Loki assumes control of Asgard, bent on carrying out some vague, nefarious plan contingent on making sure his brother never returns home. Co-written by J. Michael Straczynski, who overhauled the Thor comic franchise several years back, the story strays true the comic book’s mythos. And with his Shakespearian roots, Branagh sinks his teeth into Asgard’s palace intrigue and backstabbing. But, the repeated interplanetary toggling – divergent not just in setting but also wardrobe, tone, language, and set design – disrupts the development of characters in each realm. Consequently, Thor’s human mates are there just to provide comedic relief, give Thor a ride wherever he needs to go, and – in Jane’s case – a rather unconvincing romantic subplot. Meantime, Thor’s friends back on Asgard are so frivolous they may as well be playing dress-up on Halloween. While Loki’s machinations are suitably devious, his motives and intentions remain imprecise. The twice-visited subplot of invading and destroying the blue-hued Frost Giants and their home world co-opts the specter of Lord of the Rings, Avatar, and post-9/11 U.S. foreign policy into one tired metaphor. Indeed, guided by expediency, the vacillating storyline eventually casts the Frost Giants as both villains and victims. With a body-builder’s brawn and devilish grin, Hemsworth strikes the convincing pose of a superhero likely to appeal to men and women alike. While most of his dialogue is guttural King’s English, Hemsworth ably carries off Thor’s many battle scenes, whether hand-to-hand combat or a CG-enhanced scrap with a metallic colossus.